A Biden-Romney Fantasy Ticket So Ain’t HappeningA Washington outsider revives the hoary fantasy of a centrist third party, but it has never made any sense. 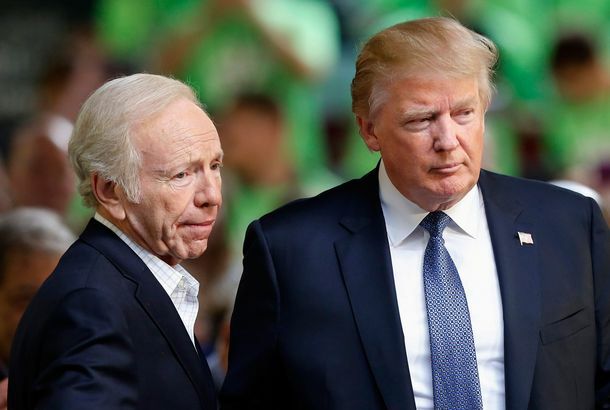 Does Trump’s Pick for Russia-Probe Attorney Mean Lieberman Won’t Head the FBI?If Lieberman is the next FBI director, Trump hiring Lieberman’s boss is a huge conflict of interest – but perhaps the president doesn’t mind. New York Times Refuses to Believe Joe Lieberman Is Really GoneHe’s still with us in spirit. Joe Lieberman Discusses Hot Sabbath SexSpit-take all over your computer screen! Man Charged With Threatening Joe Lieberman OnlineThis one was serious! Ted Kennedy Jr. Fine With Leaving Washington Dangerously Kennedy-lessHe’d rather be a father than a senator right now. How Governments Flip the Internet’s Kill SwitchLieberman thinks Obama should have a kill switch of his very own. Keith Olbermann’s Fans Want Him in the SenateObviously! Phew, Our Kennedy-less Congress May Only Last Two YearsTed Kennedy’s son could maybe, possibly run for the Senate. Joe Lieberman Apparently Unable to Find a Way to Win in 2012He’ll reportedly announce that he won’t run for reelection in 2012. Is DADT Repeal Done for Good?It was voted down in the Senate today, 57 to 40. But there is hope! DADT Repeal Hinges on When Senate Decides to Take Christmas BreakUm, maybe just hold off on vacation for a few days? Democrats Try to Shame McCain Out of Filibustering DADTLieberman opts for the public embarrassment route. Joe Lieberman Thinks Sarah Palin Is Qualified to Be His NeighborYikes. Is Joe Lieberman a Retired Man Walking?How he’ll win again in 2012 isn’t entirely clear. Two Seats That Could Determine the Power of Joe LiebermanIf they go Republican, could Lieberman switch teams? Joe Lieberman Trying to Form Another Terrifying Gang… of old white guys concerned about taxes. Lieberman: ‘The Threat Is Real to Non-Aviation Transportation’Senator says he is “worried” about the vulnerability of our trains, subways, and buses. Lieberman to Introduce ‘Don’t Ask, Don’t Tell’ RepealTake that, liberals. So What Happens Next for ‘Don’t Ask, Don’t Tell’?Five potential avenues of progress. Joe Lieberman Is Now Blocking Things in Our Everyday LivesLike a small boy’s access to syrup for his pancakes. Senate Democrats Break GOP Filibuster on Spending BillThat probably felt good, but this wasn’t the big one. MoveOn.org Raises $1 Million to Fight Joe LiebermanThey’re going to get back at him for killing the Medicare buy-in with … sock puppets! Roland Burris, and a Bunch of Other People, Could Still Hold Up Health-Care ReformHere’s why they’re still holding out, and whether we should take them seriously. Harry Reid Just Wants This Steeplechase to Be Over WithThe Democrats give in to Lieberman after meeting last night. Joe Lieberman’s Wife Comes Under AttackThose Liebermans can’t catch a break. White House: Appease LiebermanThat’s the message to Harry Reid, reportedly. Joe Lieberman Has Yet to Be Sufficiently AppeasedHe still won’t vote for the health-care bill, leaving Democrats short of 60, again. Ha, Just Kidding, There Really Is No Health-Care DealNot yet, anyway. Obama Pushes Dems to Pass Health Care Already, GeezBut he doesn’t talk about the public option. Come On, Alec Baldwin, You Know You Want ToAt least that’s how he sees it. Joe Lieberman Has Not Suddenly Gotten Cool with the Public OptionIndependent rains on Democrat’s parade. Joe Lieberman Is Playing Some Crazy Mind GamesWill he filibuster health care? It’s impossible to tell.